WASHINGTON - New Mexico Gov. 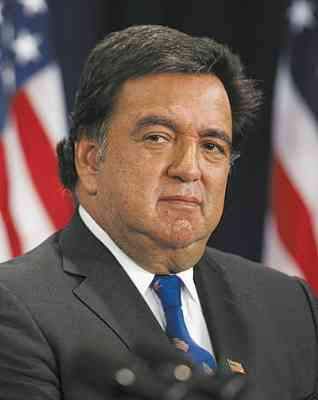 Bill Richardson abandoned his nomination to become commerce secretary under pressure of a grand jury investigation into a state contract awarded to his political donors - an investigation that threatened to embarrass President-elect Barack Obama. Richardson insisted he would be cleared in the "pay-to-play" investigation, and Obama stood by the governor as an "outstanding public servant." But both men said it has become clear that a grand jury probe would not be finished in time for Richardson's confirmation hearings and could keep him from filling the post in a timely manner. Richardson's withdrawal was the first disruption of Obama's Cabinet process and the second pay-to-play investigation that has touched Obama's transition to the presidency. The president-elect has remained above the fray in both the case of arrested Illinois Gov. Rod Blagojevich and the New Mexico case. A federal grand jury is investigating how a California company that contributed to Richardson's political activities won a New Mexico transportation contract worth nearly $1.5 million. Richardson said in a statement issued by the Obama transition office that the investigation could take weeks or months but expressed confidence it will show he and his administration acted properly. Obama spokesman Robert Gibbs said he expected a new commerce secretary to be nominated soon but didn't have a timetable. Gibbs said the problem with Richardson's nomination wasn't a matter that those tasked to look into his background missed something. "I think the totality of our Cabinet picks is impressive, and I think our vetters have done a good job," Gibbs told reporters traveling with Obama as he moved to Washington on Sunday night. A senior Obama adviser said Richardson gave assurances before he was nominated last month that he would come out fine in the investigation, and the president-elect had no reason to doubt it. But as the grand jury continued to pursue the case, it became clear that confirmation hearings would have to be delayed for six weeks or even longer until the investigation was complete, said the adviser, speaking on condition of anonymity about the discussions because they were private. Aides to both men insisted Richardson made the decision to withdraw and was not pushed out by Obama. But one Democrat involved in discussions about the matter said transition officials became increasingly nervous during the last couple of weeks that the investigation was a bigger problem than Richardson originally had indicated. Richardson spokesman Gilbert Gallegos said the governor believed the grand jury matter would be cleared up by this time but decided to withdraw when it became clear it wouldn't. "It was the governor's idea, and his decision," Gallegos said. Obama said he has accepted Richardson's withdrawal, first reported by NBC News, "with deep regret." "Governor Richardson is an outstanding public servant and would have brought to the job of commerce secretary and our economic team great insights accumulated through an extraordinary career in federal and state office," Obama said in a statement. "It is a measure of his willingness to put the nation first that he has removed himself as a candidate for the Cabinet to avoid any delay in filling this important economic post at this critical time. Although we must move quickly to fill the void left by Governor Richardson's decision, I look forward to his future service to our country and in my administration." Richardson said in his statement that he will remain as governor and told Obama, "I am eager to serve in the future in any way he deems useful. "I have concluded that the ongoing investigation also would have forced an untenable delay in the confirmation process," Richardson said. "Given the gravity of the economic situation the nation is facing, I could not in good conscience ask the president-elect and his administration to delay for one day the important work that needs to be done." The announcement came ahead of Obama's meetings today with congressional leaders about a massive economic recovery bill he wants lawmakers to pass quickly. Obama transition officials said Richardson's withdrawal would not affect the stimulus plan because the Commerce Department was not heavily involved. A person familiar with the investigation in New Mexico said the grand jury is looking into possible "pay-to-play" dealings between CDR Financial Products and someone in a position to push the contract through with the state of New Mexico.State documents show CDR was paid a total of $1.48 million in 2004 and 2005 for its work on a transportation program. In a statement issued Sunday night, CDR CEO David Rubin described Richardson as "an exceptionally able and dedicated public official, who was highly deserving of the opportunity to hold a Cabinet-level position in the new Obama Administration." Rubin also said CDR "adamantly doesn't practice pay-for-play under any circumstance on any playing field." Richardson ran against Obama in the Democratic presidential primary but withdrew after a poor showing in the Iowa caucuses and New Hampshire primary. He is one of the most prominent Hispanics in the Democratic Party, having served in Congress and as President Clinton's ambassador to the United Nations and energy secretary. As governor, he has kept up an international profile with a specialty in dealing with rogue nations. Obama also considered him to be secretary of state. CDR and Rubin have contributed at least $110,000 to three political committees formed by Richardson, according to an Associated Press review of campaign finance records. The largest donation, $75,000, was made by CDR in June 2004 - a couple of months after the transportation financing arrangement won state approval - to a political committee Richardson established before the Democratic National Convention that year. In the Illinois case, Blagojevich is accused of trying to sell the Senate seat Obama gave up to become president. "I could not in good conscience ask the president-elect and his administration to delay for one day the important work that needs to be done"